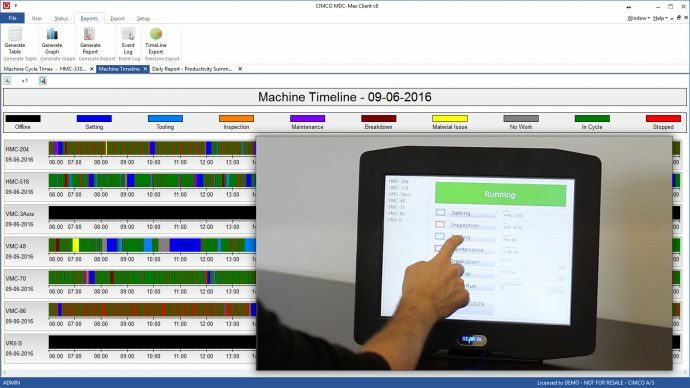 CIMCO MDC-Max is the complete MDC solution that automatically gathers and processes manufacturing data from the shop floor in real-time. Easily generate reports and charts with automatic calculation of OEE, cycle time, idle time, setup time, downtime and more. MDC-Max features real-time machine monitoring with Live Screens and has a fully customizable Operator interface for entering downtime reasons directly at the machine. MDC-Max can benefit the one man operation with a few machines and the corporate enterprise with multiple factories. The MDC-Max software is highly flexible and easily customized to fit your current and future data collection needs. Since MDC-Max is a networked solution that stores data on a central server you can monitor production from multiple locations and access the data from anywhere. A large aerospace contractor was concerned that their production was not keeping up with demand and had made the decision to buy several additional machines. It was suggested that they check the runtime clocks on the machines for a week to see how much production time was being achieved. They were astonished to find that their machine utilization was below 50% but could not get an accurate picture of why this was happening. CIMCO MDC-Max was installed to monitor the machines along with bar code readers for the operators to swipe downtime codes. MDC highlighted several problems in production, two of which were poor maintenance response and failure to replace tooling quickly enough to get the machine back in production. Following the MDC-Max installation the customer implemented several measures including a priority system for maintenance and availability of new pre-set tools. They now achieve overall machine utilization of over 68% and meet their production targets which has increased profitability so they can now invest in a new plant. CIMCO MDC-Max was recently installed at a customer site that had tooling cost issues. The production director had only recently taken over the management of the shop floor and felt that the tooling costs were too high. CIMCO MDC-Max was installed and collecting data before the night shift arrived. The next morning the production director checked the monitoring data collected from the machines and immediately had his answer. The night shift cycle times for 4 machines were 30% less than the cycle times during the day and the same machines were stopped for over an hour at the end of the shift. The operators had turned up the feed rates, but the increased feed rates resulted in poor tool tip life and increased tooling costs. The customer now has reduced tooling costs while still achieving the same production schedules and said that the system will pay for itself in a matter of months.